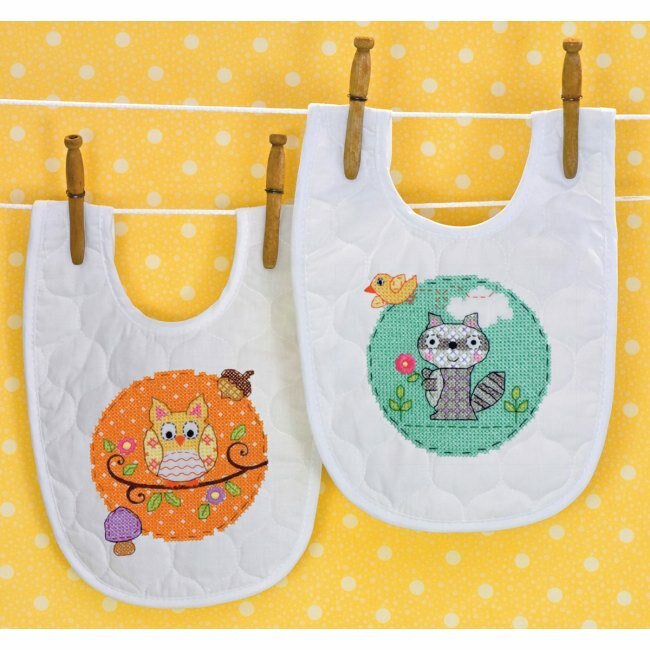 You won't want to miss the new Happi Woodland collection of Embroidery Craft Kits for baby! These too-cute-for-words woodland animal embroidery kits were designed by Dena Designs, Inc for Dimensions Needlecrafts. They're bright & sunny embroidery patterns that are sure to bring a smile to baby & parents. You'll find them in the Stamped Cross Stitch Kits section of the store! The Happi Woodland Baby Quilt Kit is a stamped cross stitch kit for you to make this adorable embroidered quilt for baby. Kit includes one pre-finished & ready-to-embroider stamped baby quilt, pre-sorted cotton thread, one embroidery needle, and instructions. 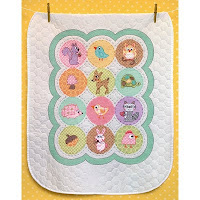 I just love the cheerful colors & fun patterns Dena Designs used to create the charming woodland animals on this quilt. Be sure to click on the images for an up-close look! 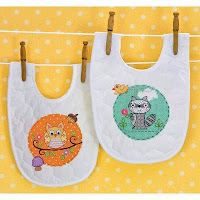 The Happi Woodland Baby Bibs Kit is a stamped cross stitch kit for you to embroider these too-cute baby bibs. Kit includes two pre-stamped quilted baby bibs, presorted cotton thread, one embroidery needle, and easy instructions. Baby bibs are an ideal stamped cross stitch kit for beginners. The smaller size makes them easy to handle and quick to stitch! If you're new to stamped cross stitch, the Dimensions website offers a helpful Stamped Cross Stitch tutorial that will help you get started. This helpful resource includes step-by-step instructions & diagrams for learning how to cross stitch. The Happi Owl Felt Applique Pillow Kit is a stamped felt craft kit for you to make this delightful owl pillow. Kit includes printed felt, cotton thread, embroidery needle, stuffing, and easy instructions. Perfect for decorating baby's nursery! 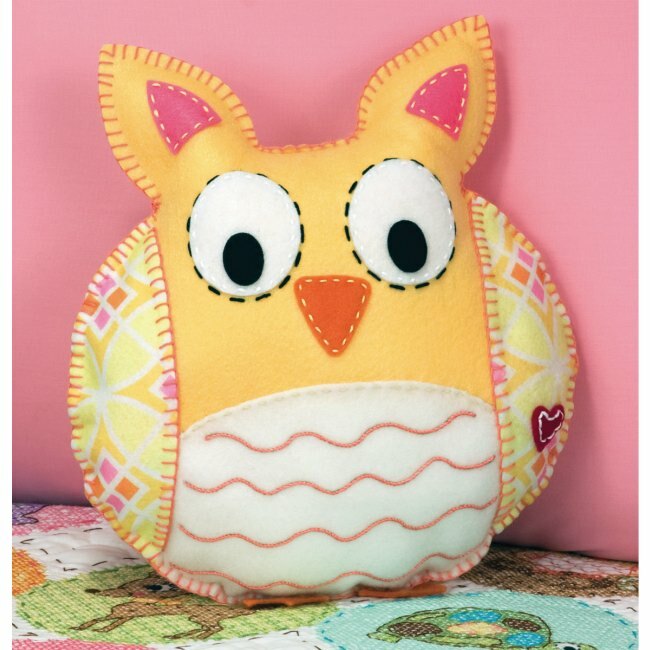 This soft owl pillow would also be a creative handmade gift for a young child or grandchild. Visit the Embroidery Kits section to see our complete selection of needle craft kits for beginners and experienced stitchers. Stamped cross stitch kits, counted cross stitch kits, crewel embroidery kits, and more! Weekend Kits offers a unique selection of creative Art & Craft Kits for crafters of all levels. We believe crafting should be easy, fun, and affordable. You'll also experience the very best in customer service. Stop by today and be ready to create something new on your next Weekend at Home!